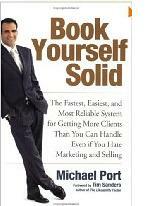 “The Fastest, Easiest, and Most Reliable System for Getting More Clients Than You Can Handle Even if You Hate Marketing and Selling” is the subtitle for the book Book Yourself Solid by author Michael Port. In this work, the author describes methods to improve your bookings as a consultant. 1. Why are you unique? 2. What are three things that make you memorable? 3. What do people always compliment you on? Practical exercises to really figure out where you are and where you’re going? We hear the question “What do you do for a living?” all the time. You professional category is the wrong answer. Don’t plan to get through this book in a single sitting. As you do the exercises, you’ll learn some useful information about your own capabilities and how to focus your efforts better. If you’re thinking of going into business yourself, or need a shot in the arm for your consultant business, then this is a book that can make a positive difference. Great resource to share with people. The one thing that I really got out of this book when I read it and implemented was to create my “Something to Invite People to” weekly event. I ended up growing my list and will soon be creating a membership community from it. This book is awesome and even if you don’t implement all the strategies you will get your money’s worth. I would love to hear what others think.